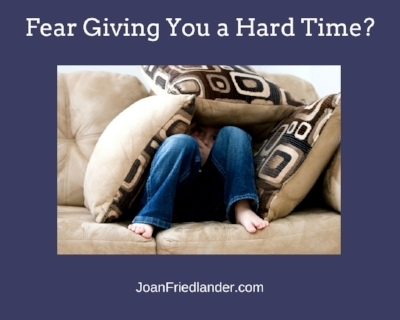 Is Fear Giving you a Hard Time? Last week was an interesting week in coaching. Three of my clients are starting to make changes that put them face-to-face with some well-worn fears or beliefs. Without their commitment to create something new in their business lives, these familiar "friends" have been able to lie low enough to be bothersome, but otherwise remain unchallenged. Even though the cruddy old beliefs and nerve-wracking fears are different for each person, the method for dismantling them is the same. Before I go on to share one of my methods, I want to acknowledge that there are a number of ways to dissolve limiting beliefs or fears, everything from locating the energy where it's held in your body then dissolving it with your attention, to the Emotional Freedom Technique to Byron Katie's famous 4 questions, "The Work." Here are the steps we've been working with. Step 1: Come up with a simple sentence that brings the fear to the surface and accurately represents the issue. Step 2: Once the sentence has been crafted, answer the following four questions. They are adapted from a set of questions that I used with clients around fears and limiting beliefs about 10 years ago when I was working with the Work Less, Make More(R) program, created by the late Jennifer White. What evidence do you have that this is true? How does this idea or belief keep you from having what you want? What is it costing you? Take the opposite point of view. What evidence do you have that this is not true? Step 3: Reflect on your responses as you answer each of the four questions. One client (I'll call her Renee) reported that she had asked similar questions in the past regarding a fear that had been working on her for years. Previously, when she sought to answer the first question, the usual suspects (family and parents) came to mind but nothing seemed to stick. This time, when answering the question, a picture came to her about something that happened when she was a teen. All at once, the source of this one particular belief about herself came to life; other experiences before and after emerged to form a full picture . This was the turning point. Any time you uncover the source of a limiting belief or fear, you'll find two parts to the story. There will be the experience, itself, bundled with your interpretation about what it means about you or them. When you are able to distinguish between the two (what happened and the meaning you ascribed) it starts the disentanglement process. The web is broken and change is possible. It may take a little while longer before Renee is able to operate free of the undue influence of of what happened in the past. But, if she remains present and takes notice whenever she is pulled to respond as if there is still something wrong, its influence will dissolve. The next time fear (or some cruddy old belief) gives you a hard time, remember there are two parts to the story. At least one of them is bound to be false.